There is a select club of teens and 20-somethings on the internet, a club that most older adults are unaware of (sorry, Rhonda.) All of them make Youtube videos on their channels—and more. Most of these YouTubers and many more have used their fame from YouTube to cross over into other industries such as fashion and literature. Connor Franta, a 22-year-old YouTuber from Minnesota, released his autobiography “A Work In Progress” on April 21, 2015. Franta’s 4,406,264 subscribers have played a huge part in its success after such a short time, as did his Tumblr fans, who have also played a large part in another YouTuber’s career. Troye Sivan Mellet, known as Troye Sivan, is a 19-year-old Australian YouTuber who currently has a hit album, an upcoming song with Zedd, (a newer pop star known by his collaborations), lots of quite popular merchandise, and 3,292,043 subscribers on YouTube. He is also a multi millionaire. At 19. How can one (young) person make so much money and be so, so successful? The romanticization of YouTubers plays a huge part in crossover success. Such fantasy “ships” or relationships as Tronnor (Troye Sivan and Connor Franta), Troyler (Troye and Tyler Oakley), or even (the confirmed non-fantasy) “Zalfie” (Zoe Sugg and Alfie Deyes.) The social media site Tumblr and to an extent Twitter seems to be the epicenter of “shipping.” So how does this affect popularity? And, the real question of this article: why are these people able to be so successful in every industry? See if you can guess this YouTuber: she has her own clothing line, a music single and over 8,000,000 subscribers. Yup, the one and only Bethany Mota. Having started on YouTube when she was 13 years old and trying to escape bullies, Mota has continued for six years, and her hard work has definitely paid off. She created her own clothing line last December and is a millionaire, in not only subscribers but in money too. Then this past October she released a single with fellow YouTuber Mike Tompkins. Many people said that she is stretching her fame a little too far. It’s interesting that a lonely, bullied 13-year-old is so popular and famous by simply uploading a video when alone in her room. These “beauty gurus” have caused quite the stir among social media and the internet community. Zoe Sugg (otherwise known as Zoella) has, like many others, released her first book: Girl Online. Although her book is simply a fictional account, its release was still very prominent. Of course, she did have a huge scandal about her possible ghost writing (when someone writes the book for another person who then gets the credit.) But she also created a beauty line; was that not her idea either? At what point can these people create whatever content they want, and simultaneously have small amounts of content that they actually create? Yet she continues to make videos that once a week her 8,000,000 subscribers can count on to brighten their Sunday. Endless comments on every site imaginable paint a different picture of these elusive, but somehow so public, people. Fans have put them on a pedestal, and are earning them seven-figure paychecks by trying to figure out every aspect of their lives. Tronnor shippers have bought Connor’s book to find out if he is in a relationship (spoiler: he’s apparently in love) and then have purchased Troye’s album to speculate on which songs are written about whom. Motavators want to wear what Bethany does. Zoe’s subscribers want her perfect cat-eye eyeliner tutorial, and they want to know exactly how her skin tone is so pretty and even. 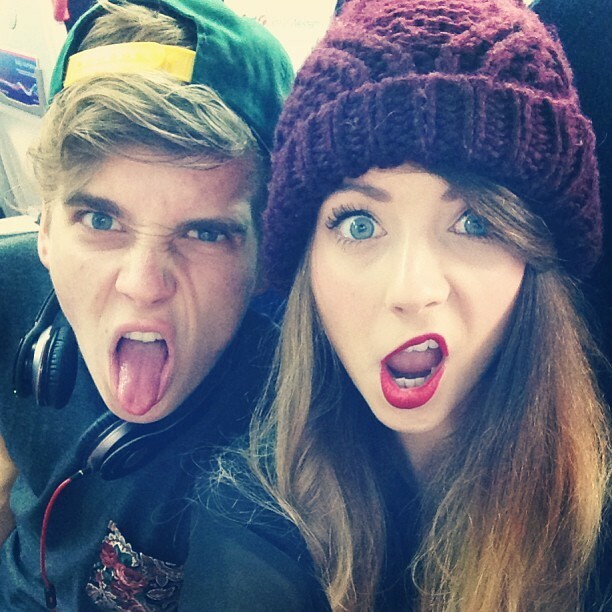 Then they go and watch her brother Joe who has trended the idea of “The Sugg life chose me.” This excessive money-squeezing works for two reasons only: people are not interested in or satisfied with their own lives and want to be “perfect” like their idol, or have way too much free time to worry about whether Tronnor is real or not. So are their millions of dollars coming from regular people like us having no social lives? Or are these people truly extraordinary and deserve the money and fans that they have? They seem perfect and happy, but they receive hundreds of hate comments every day. As Zoe Sugg said, “I don’t want you guys to think I’m perfect and I have a perfect life. It can be very overwhelming.” We are the targets of this “perfect” image because we all strive for perfection. And these YouTubers, no matter what industry they’re in, give us the sensation of perfection. And that is why we all wait for Frantastic Mondays and Sugg Sundays.